This is your last week to catch a fascinating retrospective at the ICA, This Might Have Been: Art, Love and Politics in the 1980s. 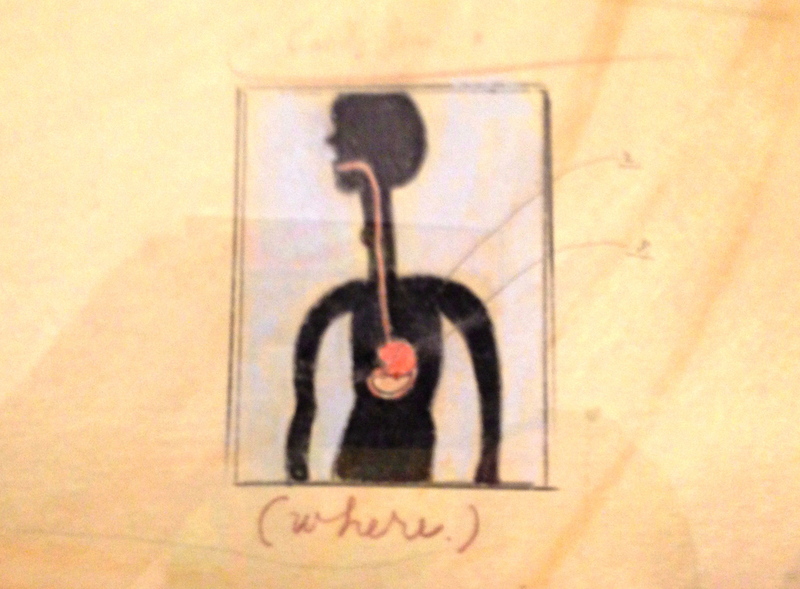 Click here to read the ICA’s writeup about the show, which closes March 3rd. One of the things I love about visiting the ICA is how you can turn to anyone working there and they’ll happily talk to you about what you’re looking at. What the hell was that artist thinking when they painted a canvas entirely black? Ask any guard at the ICA and they’ll tell you where the artist was coming from, why that big paint splotch is art, and why the piece was chosen to be included in an exhibit. For those of us uninitiated or just plain clueless about contemporary art, this is huge. I can’t think of another museum where the guards are trained and encouraged to interact with visitors like this. Many of them, like Walker Roman, the guard we spoke to during our last visit (click here to see his portfolio), are talented working artists themselves. 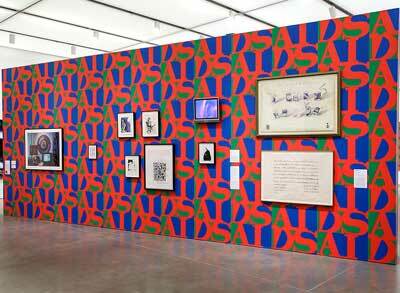 And because so many of the ICA’s guards are artists, trained art historians, or both, they understand and can better explain the technical aspects and mindset of the artists whose work is on display. Two of my favorite pieces in the show are by Candy Jernigan. Married to composer Phillip Glass, Jernigan is a relatively unknown artist whose career was cut short in 1991 when she died at 39 of liver cancer. Her Homage to Goya and Found Dope II are painstakingly organized pieces that convey order and meaning to the mundane. Jernigan gives her found and featured objects power by organizing them the way she does. Both of her pieces, each quite different stylistically, share what it’s like to live the artist’s life. Hint: it ain’t easy. Being an artist is a calling and a compulsion. Found Dope Part II carefully records the chronology, type, and location of crack vials that littered Jernigan’s East Village neighborhood. Spanning some 16 days and covering a three block radius, she cataloged hundreds of crack vials and tops (308 to be exact), many in neon colors that were popular during that period (designer Stephen Sprouse’s Day-glo inspired fashion from the era comes to mind). We see clusters of vials on a map, each segment indicating people binging on crack. The tiny plastic reminders symbolize the endless cycle of drug-fueled destruction and then creation via Jernigan’s art; death and re-birth, as new crack is scored and the party begins anew. 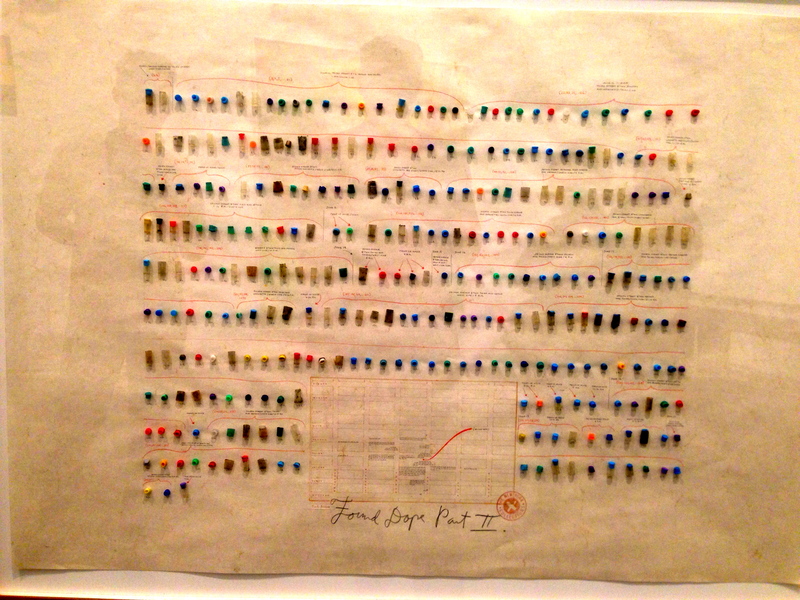 Jernigan’s sanitized druggie census is a snapshot of how fucked up but also vibrant the East Village was during the city’s crack epidemic, and how totally gentrified the area is now–thanks in large part to the artists like Jernigan who settled there and were eventually driven out by real estate developers…the artists themselves victims of their own successful yet inadvertent sanitizing. 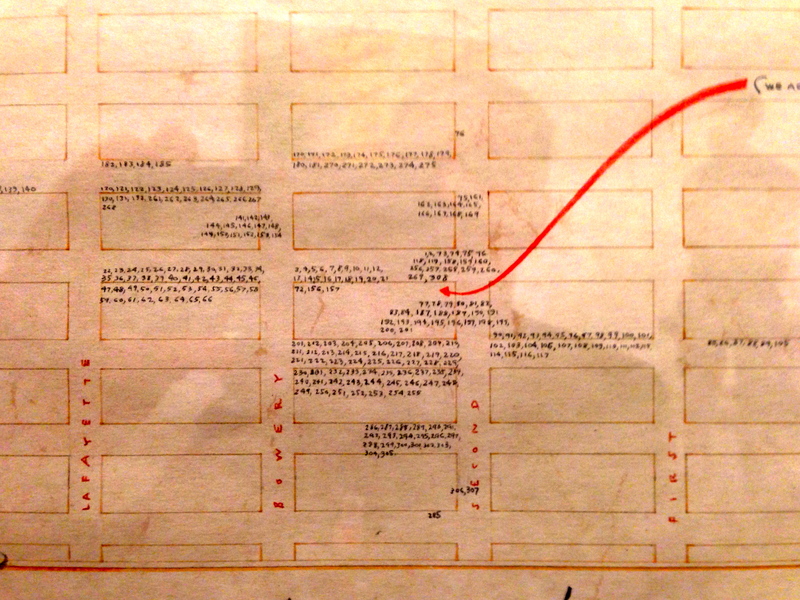 The obsessive meticulousness of Jernigan’s diagram echoes crackheads’ endless quest to score their next high. Who is more compulsive: the artist or her drugged out neighbors? Found Dope Part II, 1986. Found objects on paper. Candy Jernigan Foundation for the Arts, Inc. and Greene Naftali, New York. Map detail, Found Dope Part II. Displayed above Found Dope II is Jernigan’s Homage to Goya, its title a pun on the famous Spanish artist Francisco Goya. It also refers to her survival on the classic diet of starving artists everywhere: cheap, canned beans. 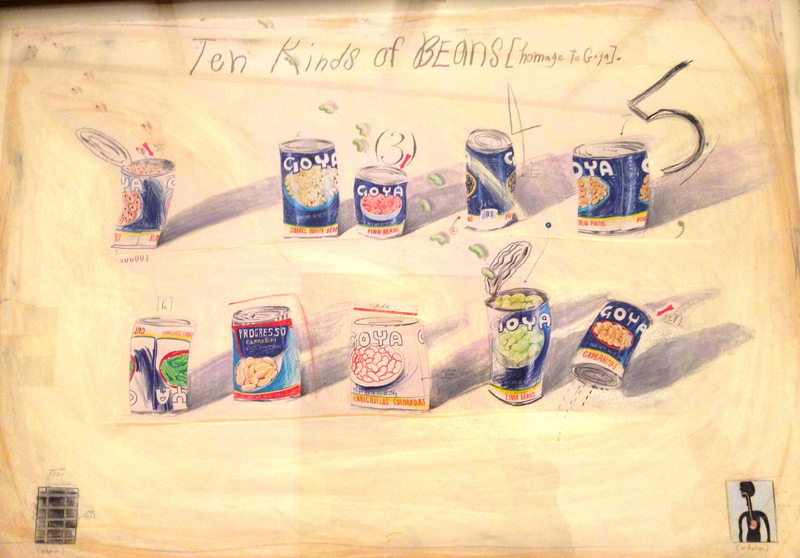 Jernigan’s cartoonish lopsided cans, with their numbers and arrows, as well as tiny accompanying diagrams of the beans’ source and destination, manage to be witty, thought provoking and depressing all at once. Candy Jernigan’s Homage to Goya, 1986. Down the hatch. Detail from Homage to Goya. Great insights on the ICA staff and paintings. Thanks! Those guards are what make the ICA such a great place. That and the great glass elevator. And the views of Boston Harbor. And the summer dance parties! You’re a terrific writer Jenn Bruni! “The party begins anew.” Love that. If the training of guards and staff in other venues used the ICA’s model, I imagine there being much more engagement between visitors and personel that would bring lots of smiles. Thank you for introducing me to Jernigan’s art. The color and design of Found Dope II is amazing, while the concept is provocative. Keep the words flowing. thank you, Andrew. The ICA is one of my favorite museums anywhere, and it’s kind of overlooked by people here in Boston, which is weird…hopefully that’s about to change, because the neighborhood it’s in (renamed the Innovation District by the mayor) is booming. Yay. The curator(s) at the ICA really try to find art that’s not typically seen by the masses, which is also a great thing. take care! Great article, We love the ICA, although I do not quiet understand the how the “homage to Goya” has anything to do with the Spanish artist. He did act out against the views of his time, but somewhat underground, the famous painting of his mistress, he did duplicates one of his vision and one according to the church expectation, and hide the “provocative” one under the official painting. And later in life he just went completely mad, painting the horrors of Apocalypse over and over. He was quiet known in his time as he was the Spanish court painter and had commissions for paintings and portrets, so he was not a starving artist. hi Rosalia, thanks for reading, and for your interesting perspective and background on Goya. I would say the homage is in the name only — the brand of beans and how it happens to be the same as a famous artist — who, as you point out, certainly wasn’t starving, thanks to his royal patrons. Since we can’t ask Jernigan, I’d venture that there was no other connection intended, other than the beans and the artist happen to have the same name…a play on words. Love me some crack vials in pretty colors! What is most interesting to me, however, is the whole “people as objects” phenomenon being smashed at the ICA. Guards as artists/ historian adding to the conversation is refreshing and markedly “un-classist” as can be. Love this and wish you would explore the topic further, beginning with Vietnamese nail salons. There are people in our society living in glass cases that thwart conversation, eye contact, normal human politeness even. As Sesame Street taught us to ask/notice, Who Re the people in your neighborhood? The people that you meet when you’re walking down the street each dayyyyyyyyy! And folks who do nails in glass cases shouldn’t throw hot massage stones…or something like that. My kid walks to school and we know most of the peeps in our neighborhood, but we are a rarity in these “stranger danger” daze…yay for the ICA and their really, truly interactive exhibits! I still remember at 16 going to the Uffizi for the first time and trying to talk to a guard who was like “MEH” about the giant Botticelli masterpieces surrounding him…sadness! “SILENZIO!! !” I would be a terrible professional Vatican shusser…a thankless occupation, especially with a chatterbox like me around. Once when my son Jonah was little I took him to the Gardner Museum, lunch was to be included in the package. He may have been too close to something or been a bit loud. The guard standing near him was so punishing in his voice that the poor child was terrified, broke down in tears and refused to go there again. Unfortunately, we had to leave immediately. He hasn’t been big on museums ever since. Too bad all museums don’t have guards like the ones at the ICA. wow Karen, what a memory…the guard picked a perfect way to turn off younger generations for life towards art & culture – that guy should have been re-assigned to the coat room and then re-educated before getting back on the floor! Btw I love the Stewart-Gardener museum, especially now that they’ve added that cool new wing. Wanna hang out in that lounge area and do some writing sometime…with those little birds chirping in their bamboo cages. Wish the original central courtyard/garden area was more conducive for chilling out, but I guess that area is too delicate for even the tiniest group of admirers.